When thirty-one-year-old Brett Donovan returns to Black Creek, Kansas, the accusation that tainted his life still remains. Disowned seven years ago by his father because of a lie, Brett knows that mud sticks. How can he contemplate a future here, when those around him are only too willing to remind him of his past? Fay Maverick has always loved Brett. Their brief affair some seven years ago ended before it had really begun. Even if it means going against her four older brothers wishes, she will use every trick in the book to win her man back. Can she convince Brett to stay, or will her brothers try and run him out of town? With the Maverick brothers hot on his tail, Brett knows that staying around Black Creek could be dangerous. Should he leave, or will nights of passion with Fay prove far too tempting? Fay breathed in. That tight knot of tension had been there ever since she'd learned that Brett Donovan had come back to Black Creek. 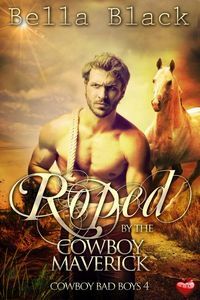 The closer she got to his ranch, the tighter the coil grew in her stomach. She urged the gray appaloosa faster. "Come, Cinders, just a little farther. I'm the one feeling nervous, not you." It was funny how animals picked up one's mood. When Brett had left Black Creek some seven years before, it had felt like the bottom had dropped out of her world. Now that he was back, she didn't know how she felt. She guessed that was the reason why she was visiting today. See if any feelings were left between them. The ranch grew closer until she finally drew up outside and dismounted. "Anyone home?" she called. Surely, he would have heard her approach? Maybe he was out back. Fay took the still-warm apple pie from her saddlebag and walked around the side of the ranch house. "Brett," she called again. The fly screen swung open, and he stepped out onto the decking. It shut behind him, and he leaned against it. Brett had been twenty-four when she'd last seen him. He'd been a man then, but he was even more of a man now. Standing about six-three and weighing some two hundred pounds, he was dressed in tight jeans and black denim shirt. He appeared broader than she remembered. Her gaze drifted over him. His fair hair was kissed by the sun and fell about his manly features in streaks of gold. The channels on either side of his face were even deeper. She'd always loved the way they would spread into a dimple when he smiled at her. Though he wasn't smiling now. Instead his deep blue eyes connected with hers. They seemed to consume her body from her head to her toes. A deep satisfaction flowed through her veins. The sexual attraction was still there between them. Only now it seemed magnified. No man had ever looked at her in that primal way, no man apart from Brett. "Good to see you again, Fay." His deep voice lifted the hairs on the back of her neck. "You, too, Brett." She held out the bag she'd brought with her. "It's an apple pie." "Did your mother bake it?" "No, Ma's been dead some five years now." "Me, too, about your Pa, I mean." He let out a long, slow breath. "Your brothers know you're here?" She shook her head. "They don't need to know everything I do." "Well, perhaps you ought to tell them that." "Cody came calling last night. Said I should keep away from you." "Oh? They're just over possessive, what with Ma dying and all." He stared at her, assessing her, making her knees go weak. "You lookŢ He shrugged. "All grown up. You're not the girl I remember." At eighteen, she had worn all her emotions on her sleeve. Seven years ago she had carried a huge torch for Brett Donovan. She guessed he'd always known that. Taking on the role that her mother had left when she died made her grow up in a hurry. "I'm a woman now, Brett. I'm not that girl you once knew." "So I see." He stared at her long and hard then said, "I've got some hot coffee on the stove. Would you like some?" Coffee Time Romance & More Reviews.